More than a week since its premiere, The Drug Hunter has finally broken CSM52 ratings of 1% to contend with current ratings leader Mask. It has also managed to overtake Legend of Fuyao's hot streak to take first in web rankings. Although seeing a drop in viewership in the episodes leading up to the finale, Sweet Dreams retains a wide lead against the rest of the shows based on CSMNationwide. 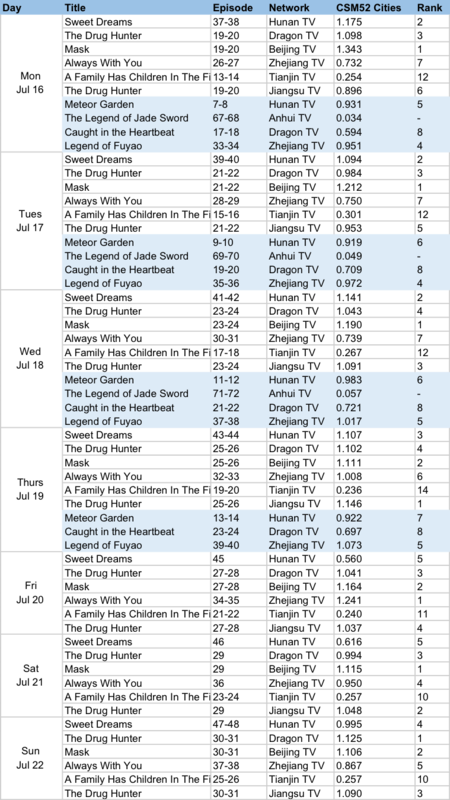 Meteor Garden 2018 and Legend of Fuyao are the two shows that have reached 1% despite not airing on primetime. Zhu Yilong who's been gaining attention because of his role in Guardian has topped celeb rankings for the third week in a row. ZYL deserves it! He’s so underrated. Guardian is sort of like good mutants vs evil mutants similar to x-men. Meteor Garden has several episodes done like a cooking drama. There are more drama start this week and next week too. I think its pretty lucky to be able to broadcast on TV and avoid the bigger dramas like Heavy Sweetness Ash-like Frost and Martial Universe which would air in August. Ratings wise, it passed 1 and is leading with online views despite having only one online platform. Very happy for Legend of Yun Xi and the stars too!. It's my current C-Drama obsession. CSM Nationwide cannot be used to compare Hunan dramas. If you noticed, Hunan TV dramas is always 1st in CSM Nationwide regardless of the drama and who they are against. Still watching My Story For You and Youth (2018) (remake of korea Age Of Youth or Hello My Twenties).